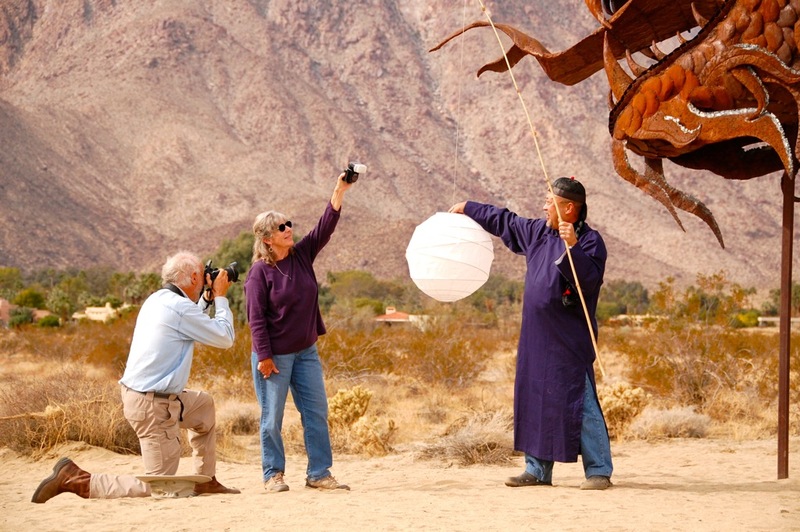 There were reports that a dragon has been sighted in Borrego Valley of Anza-Borrego Desert State Park, so we set up our Safari in Borrego Palm Canyon and joined writer/photographer Bert Gildart and his wife Janie on a hunt for dragons and other game along the way. 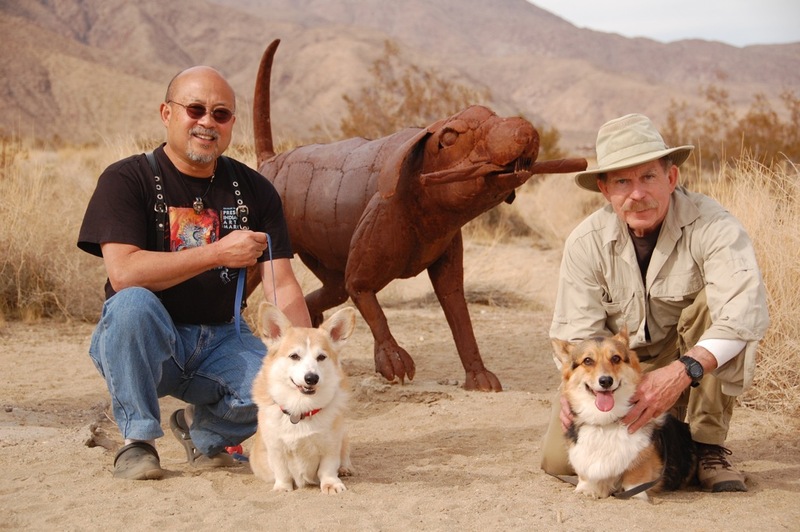 We rendezvoused with Bert and Janie at Borrego Springs’ Christmas Circle and traveled north on Borrego Springs Road. The topography here reminded me of Ernest Hemingway’s description of parts of Africa where “the country began to open out into dry, sandy, bush-bordered prairies that dried into a typical desert country…” (Green Hills of Africa, Scribner, 1963, New York, page 160). 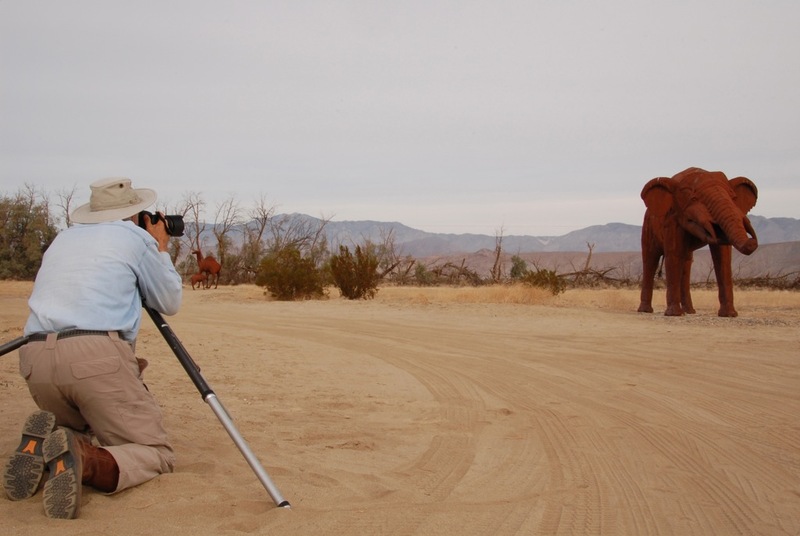 It wasn’t long before we spotted big game off to the right and we pulled off the road for a photo shoot. It looked like elephants and camels were here. 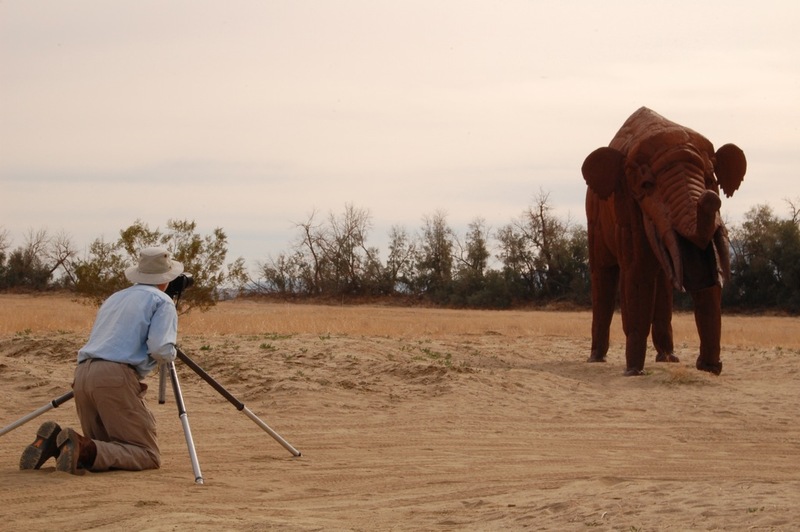 Bert started taking photos a safe distance from these creatures, but one seemed to become wary and turned abruptly toward him. 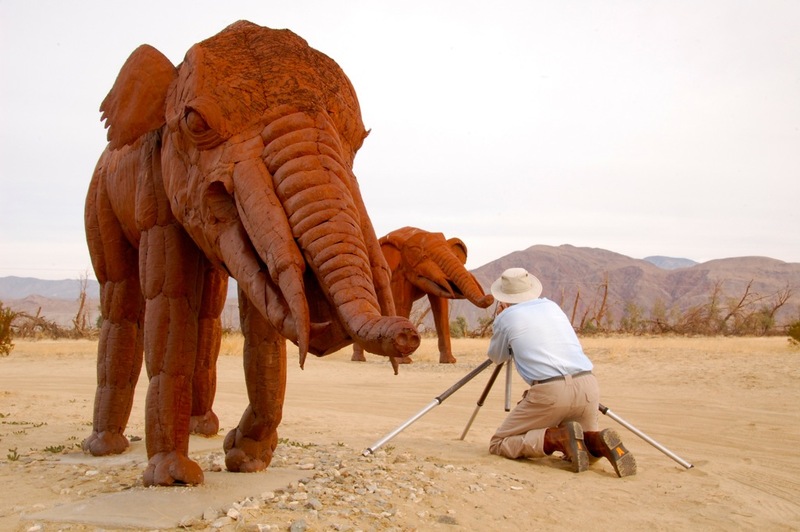 As the space diminished between us, it became obvious that these creatures were actually large metal sculptures, Sky Art, created by sculptor/designer Ricardo Breceda for Dennis Avery’s Galleta Meadows Estate, depicting Gomphotheres, Camelops, and other creatures that roamed here during the Pliocene, Pleistocene, and Miocene eras, millions of years ago. Larry and I had visited this Sky Art two years ago as seen in my “Springtime in Galleta Meadows” post. We retreated back to our trucks and resumed our pursuit of fabled quarry, the dragon. 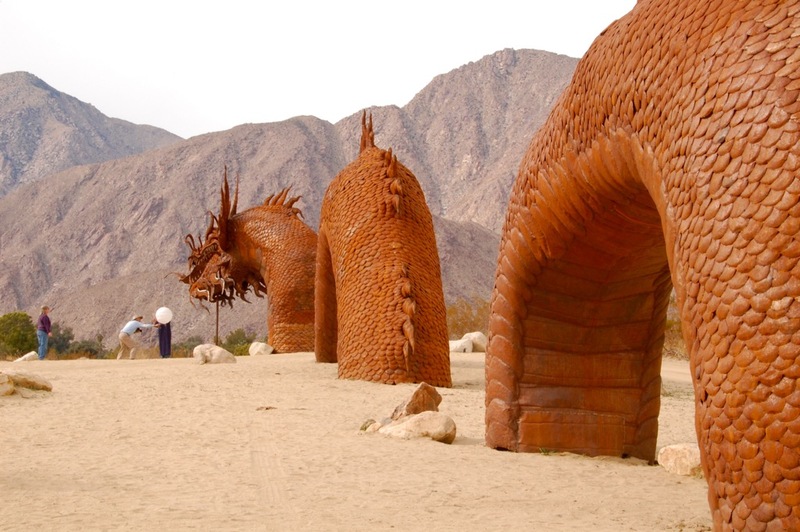 Further down the road, we caught sight of its humps and pulled over to visually take in all 350 feet of The Serpent with a Chinese dragon’s head and rattlesnake tail undulating in and out of the desert sand. We then respectfully approached for a planned photo shoot. 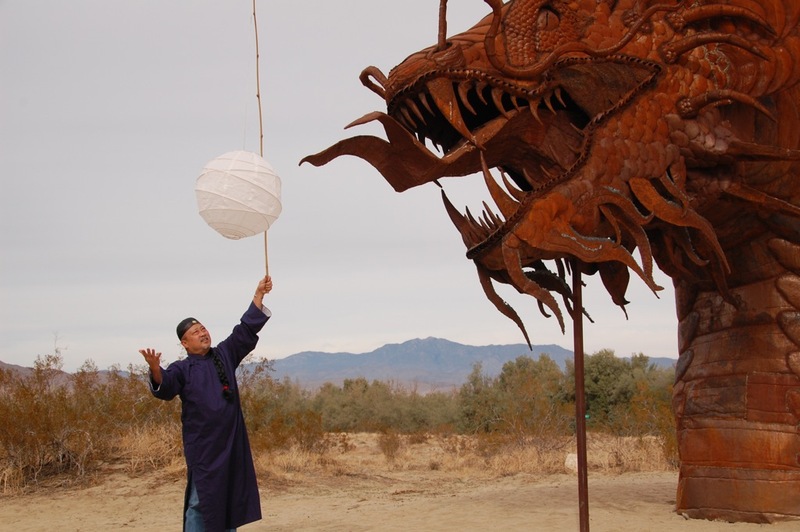 Larry used a long bamboo pole to levitate a white Chinese lantern symbolizing the pearl of wisdom and knowledge, which the benevolent Chinese Dragon is fond of pursuing. The pearl also symbolizes truth, enlightenment, wealth, good luck, and prosperity. The idea for this sculpture began with Dennis Avery. “Dennis also is keenly attuned to Chinese culture through his wife, Sally Tsui Wong-Avery, who is founder of the Chinese Service Center in San Diego and the principal of San Diego’s Chinese Language School,” writes Diana Lindsay in her new book, Ricardo Breceda: Accidental Artist, Sunbelt Publications, Inc., 2012, page 205. The arrival of this Chinese dragon is timely and auspicious as we enter the Year of the Dragon, which begins on January 23, 2012. 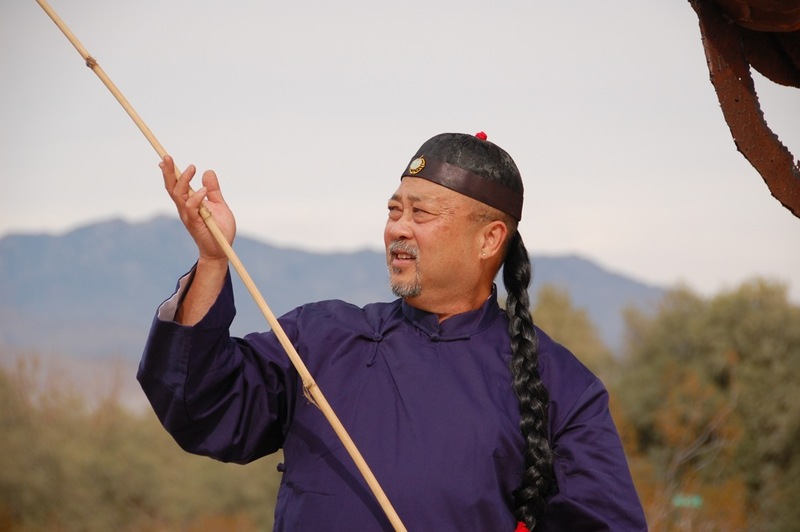 It’s a time to say “Gung Hay Fat Choy,” and watch the Dragon Dance! Oh, there is one more thing… the second day of the 15-day Chinese New Year celebration is considered the birthday of all dogs!